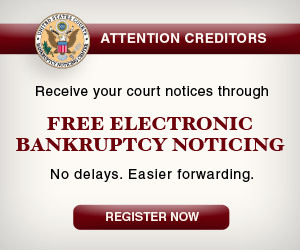 Welcome to the Creditors section of the Court's website. Here you will find information pertinent to you and your business with the Court. To file a Proof of Claim electronically with the Court's online filing system, or to learn more, click here. Penalty for filing a fraudulent claim: Fine of up to $500,000, imprisonment for up to 5 years, or both. 18 U.S.C 152. All filers must redact social security or taxpayer-identification numbers, dates of birth, names of minor children, and financial account numbers, in compliance with Bankruptcy Rule 9037. This requirement applies to all documents, including attachments.